Microwater: The Liquid of Life! Microwater: What Kind of Water Is This? Microwater is alkaline ionized (or electrolyzed, or restructured, or MicroClustered) water. The most recent name given to alkaline water is "Kangen Water". We believe that the only reason for this latest innovation is to lead consumers to believe that the Enagic Leveluk brand of water ionizers are so superior to others and so justify the high price charged. The truth is that Toyo, the company which made legendary Microwater units such as the Pure Porte II and the Protec, sold its renown technology to Enagic. This technology was incorporated in to the Leveluk models which produces the same alkaline water Enagic now calls "Kangen Water". Do your home work before you buy. You don't need to spend $4,000 for a quality water ionizer. Nevertheless, regardless of what you call it Microwater, Kangen water, or MicroClustered water, alkaline water represents the ultimate form of drinking water. The Microwater ionizer is a Japanese invention and is currently listed as a medical device in that country. Alkaline mineral rich, Microwater is used in various Japanese hospitals to treat diabetes, high blood pressure and other diseases. 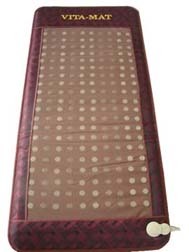 It is also used in millions of homes in Japan. So what is Microwater? 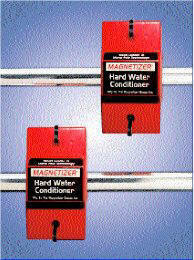 Microwater is water that has been restructured as a result of electrolysis. Using a patented process, electrolysis separates properties found in water and concentrates the positive and negative ions which are found in normal tap water into clusters of alkalinity and acidity. The alkaline-concentrated water is consumed, while the acid-concentrated water is an excellent astringent water and general cleansing water for external uses. 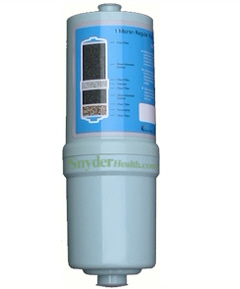 It is important that you understand the difference between Microwater and other water filtration systems. Also, be sure to read the excellent research compiled by Microwaterman.com to advance your understanding of why alkaline ion water is so beneficial for your health. Be sure to request the "Miracle Water" video. How Does The Microwater Unit Works? 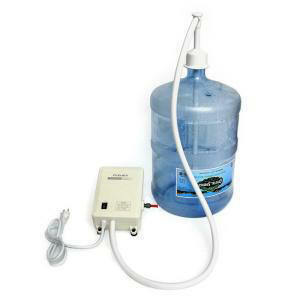 A Microwater filter is not a regular water filter. First, the tap water is first filtered to reduce the chlorine and sediment levels by approximately 99% and any foul odor or tastes that may be present in the tap water. The filtered water, with the alkaline and acidic electrolytes present, then flows through the electrolysis chamber where the tap water clusters broken down and are separated into alkaline and acidic concentrated water clusters. Once the electrolysis is performed, the two separated waters are delivered through the faucet diverter (alkaline, drinking water), and the secondary water (acid, astringent water) through a secondary hose. In certain units, the alkaline water is delivered through the kitchen faucet. For a more detailed explanation of Microwater and its health benefits we encourage you to read the following article we've entitled Why Drink Alkaline Ionized Microwater? written by By Dr. Hidemitsu Hayashi, M.D. This video demonstrates the incredible effectiveness of Alkaline water commonly known as Microwater. We invite you to watch clips of this video on our alkaline water video page. Please give it a few minutes to load. In this news broadcast a Japanese man discharged himself from a hospital two days before he was scheduled to have his left foot and the big toe on his right foot amputated due to diabetes. He checked himself into a hospital he learned about while watching the news at the first hospital. Forty Five (45) days later he was able to walk on his own two feet without a crutch and his normal daily Insulin intake of 16 units a day was reduced to 10 units a day. The doctors pointed out that the only thing that they administered internally was five liters of "Miracle Water" a day and his regular insulin medication. His foot was socked in super acidic water (pH 2.4) and was spared the typical medical remedy of amputation. While all our water ionizers produce both alkaline and acid water, the only water ionizer we have that can produce super acid 2.5 pH water is the Excel 900. Neither reverse osmosis or the mineral deficient distilled water is not as effective at removing acid wastes as electrolyzed (ionized) alkaline ion water. What is IONIZED WATER (MICROWATER)? A High percentage of living things, both plant and animal are found in water. All life on earth is thought to have arisen from water. The bodies of all living organisms are composed largely of water. About 70 to 90 percent of all organic matter is water. The chemical reactions in all plants and animals that support life take place in a water medium . Water not only provides the medium to make these life sustaining reactions possible, but water itself is often an important reactant or product of these reactions. In short, the chemistry of life is water chemistry. In a water molecule, two hydrogen atoms are covalently bonded to the oxygen atom. But because the oxygen atom is larger than the hydrogen's, its attraction for the hydrogen's electrons is correspondingly greater so the electrons are drawn closer into the shell of the larger oxygen atom and away from the hydrogen shells. This means that although the water molecule as a whole is stable, the greater mass of the oxygen nucleus tends to draw in all the electrons in the molecule including the shared hydrogen electrons giving the oxygen portion of the molecule a slight electronegative charge. The shells of the hydrogen atoms, because their electrons are closer to the oxygen, take on a small electropositive charge. This means water molecules have a tendency to form weak bonds with water molecules because the oxygen end of the molecule is negative and the hydrogen ends are positive. To illustrate water's ability to break down other substances, consider the simple example of putting a small amount of table salt in a glass of tap water. With dry salt (NaCl) the attraction between the electropositive sodium (Na+) and electronegative chlorine (Cl-) atoms of salt is very strong until it is placed in water. 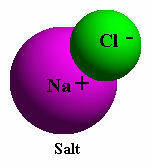 After salt is placed in water, the attraction of the electronegative oxygen of the water molecule for the positively charged sodium ions, and the similar attraction of the electropositive hydrogen ends of the water molecule for the negatively charged chloride ions, are greater than the mutual attraction between the outnumbered Na+ and Cl- ions. In water the ionic bonds of the sodium chloride molecule are broken easily because of the competitive action of the numerous water molecules. As we can see from this simple example, even the delicate configuration of individual water molecules enables them to break relatively stronger bonds by converging on them. This is why we call water the universal solvent. 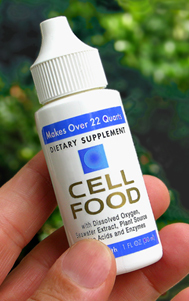 It is a natural solution that breaks the bonds of larger, more complex molecules. This is the chemistry of life on earth, in water and on land. Basically, reduction means the addition of an electron (e-), and its converse, oxidation means the removal of an electron. The addition of an electron, reduction, stores energy in the reduced compound. The removal of an electron, oxidation, liberates energy from the oxidized compound. 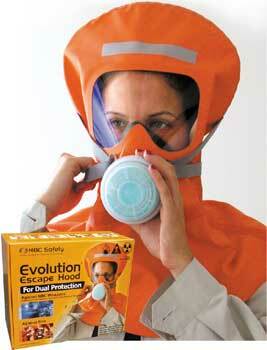 Whenever one substance is reduced, another is oxidized. 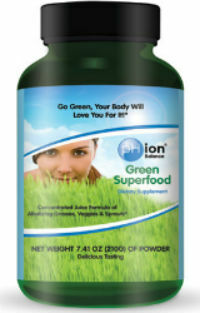 Living things are extremely sensitive to pH and function best (with certain exceptions, such as certain portions of the digestive tract) when solutions are nearly neutral. Most interior living matter (excluding the cell nucleus) has a pH of about 6.8. Problems arise, however, when too many of these free radicals are turned loose in the body where they can also damage normal tissue. These substances are also produced naturally in the digestive tract when we digest food, resulting in the unpleasant odor evidenced in feces. Putrefaction of spoiled food is caused by microbes in the air; this natural process is duplicated in the digestive tract by intestinal microbes. All these waste products of digestion are pathogenic, that is, they can cause disease in the body. 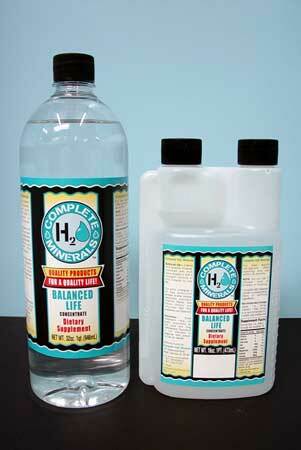 Hydrogen sulfide and ammonia are tissue toxins that can damage the liver. Histamines contribute to allergic disorders such as atopic dermatitis, urticaria (hives) and asthma. Indoles and phenols are considered carcinogenic. Because waste products such as hydrogen sulfide, ammonia, histamines, phenols and indoles are toxic, the body's defense mechanisms try to eliminate them by releasing neutrophils (a type of leukocyte, or white corpuscle). These neutrophils produce active oxygen, oddball oxygen molecules that are capable of scavenging disintegrating tissues by gathering electrons from the molecules of toxic cells. Because active oxygen can damage normal tissue, it is essential to scavenge this active oxygen from the body before it can cause disintegration of healthy tissue. If we can find an effective method to block the oxidation of healthy tissue by active oxygen, then we can attempt to prevent disease. Research on the link between diet and cancer is far from complete, but some evidence indicates that what we eat may affect our susceptibility to cancer. Some foods seem to help defend against cancer, others appear to promote it. Much of the damage caused by carcinogenic substances in food may come about because of an oxidation reaction in the cell. In this process, an oddball oxygen molecule may damage the genetic code of the cell. Some researchers believe that substances that prevent oxidation -- called ANTIOXIDANTS -- can block the damage. This leads naturally to the theory that the intake of natural antioxidants could be an important aspect of the body's defense against cancer. Substances that some believe inhibit cancer include vitamin C, vitamin E, beta-carotene, selenium, and gluthione (an amino acid). These substances are reducing agents. They supply electrons to free radicals and block the interaction of the free radical with normal tissue. There is no substitute for a healthy balanced diet, especially rich in antioxidant materials such as vitamin C, vitamin E, beta-carotene, and other foods that are good for us. However, these substances are not the best source of free electrons that can block the oxidation of healthy tissue by active oxygen. The reduction potential of water can be dramatically increased over other antioxidants in food or vitamin supplements. Normal tap water, for example, with a pH of 7 is approximately neutral on the pH scale of 0 to 14. When measured with an ORP (oxidation potential) meter its redox potential is approximately +400 to +500 mV. Because it has a positive redox potential, it is apt to acquire electrons and oxidize other molecules. Reduced Ionized Water, on the other hand, has a negative redox potential of approximately -250 to -350 mV. This means it has a large mass of electrons ready to donate to electron-thieving active oxygen. Before discussing the properties of Ionized Water further, let's take a look at what happens inside an Ionized Water producing unit. Traditionally we have judged the properties of water from the standpoint of pH, in other words whether water is acidic or alkaline. According to Dr. Yoshiaki Matsuo PhD., the inventor of the Ionized Water unit, "In my opinion, redox potential is more important than pH. The importance of pH is over emphasized. For example, the average pH of blood is 7.4 and acidosis or alkalosis are defined according to deviation within the range of 7.4 +- 0.005. But nothing has been discussed about ORP, or oxidation-reduction potential." The Ionized Water (Microwater) unit produces two kinds of water with different redox potentials, one with a high reduction potential and the other with a high oxidation potential. Oxidized water with its redox potential of +700 to +800 mV is an oxidizing agent that can withdraw electrons from bacteria and kill them. The oxidized water from the Ionized Water unit can be used to clean hands, kitchen utensils, fresh vegetables and fruits, and to sterilize cutting boards and minor wounds. Tests have shown that oxidized water can be used effectively to treat athlete's foot, minor burns, insect bites, scratches, and so on. Although hyperoxidized water is a powerful sterilizing agent, it won't harm the skin. In fact, it can be used to heal. Hyperoxidized water has proven effective in Japanese hospitals in the treatment of bedsores and operative wounds with complicated infections. Today we read much about correct dieting principles and paying attention to what we eat in order to stay healthy. This is a sensible practice, but it is surprising that many of us don't realize that the bulk of what eat is composed of water. Vegetables and fruits are 90% water; fish and meat are about 70% water as well. 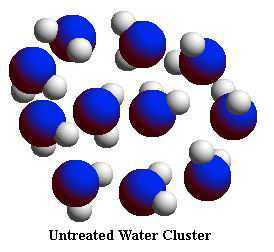 NMR (Nuclear Magnetic Resonance) analysis reveals that tap water and well water consists of clusters of 10 to 13 H2 0 molecules. 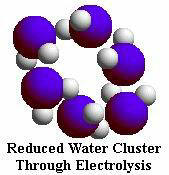 Electrolysis of water in the Ionized Water unit reduces these clusters to about half their normal size -- 5 to 6 water molecules per cluster. As the graph shows, the NMR signal that measures cluster size by line width at half-amplitude shows 65 Hz for reduced water and 133 Hz for tap water, revealing that the reduced water clusters are approximately half the size of tap water clusters. According to Dr. Hidemitsu Hayashi, Director of the Water Institute of Japan, "To eliminate the pollutants in a large stream that is contaminated at its source, we must work on the problems upstream at the headwaters -- the source of the pollution -- not downstream where we can only try to treat the evidence of damage caused by the pollution. Ionized Water's contribution to preventive medicine is essentially upstream treatment." According to our model, we consider the digestive tract upstream where we intake water and food. Although many people today in developed countries are growing more skeptical about what they eat, they tend to concentrate more on what the food contains rather than the metabolized products of foods in the digestive tract. For example, consider the typical balanced diet of meat and vegetables. Meat protein is metabolized into amines while nitrates from fertilizers used to grow vegetables metabolize into nitrites in the digestive tract. These amines and nitrites combine to form nitrosamine, a recognized carcinogen. We've already discussed that odoriferous feces are evidence of excessive fermentation in the digestive tract, so reduced water performs a very important function upstream in the digestive tract by reducing this excessive fermentation as evidenced by cleaner stools within days of starting a steady regimen of reduced water. We are now in the midst of a water boom. In Japan and other countries consumers are buying various kinds of bottled and canned water even though water is one of our most abundant vital resources. Research data reveals that mineral waters have an ORP of +200 mV, slightly lower than the +400 mV measured for ordinary tap water. We can say that at least mineral water is marginally better than tap water from the viewpoint of ORP. Compared to any processed water for sale, however, Ionized Water with its reduction potential of -250 to -300 mV is beyond comparison due to its ability to scavenge active oxygen radicals. <> The statements enclosed herein have not been evaluated by the Food and Drug Administration, Canadian or Mexican health authorities . 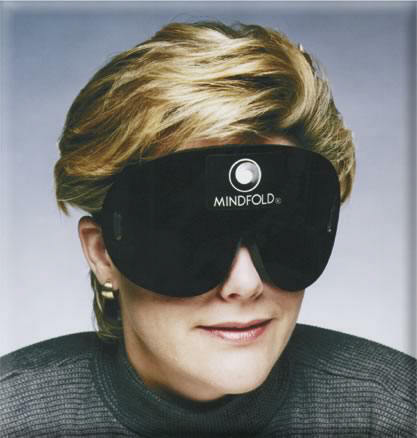 The products mentioned on this site are not intended to diagnose, treat, cure, or prevent any disease. Information and statements made are for education purposes and are not intended to replace the advice of your family doctor. We hope that you now have a great understanding of what Microwater is. 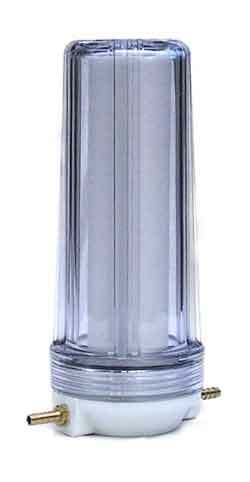 It is important that you understand the the Difference between Microwater and other types of water filters. For even more in-depth understanding of this technology read from our Alkaline Water Research page. 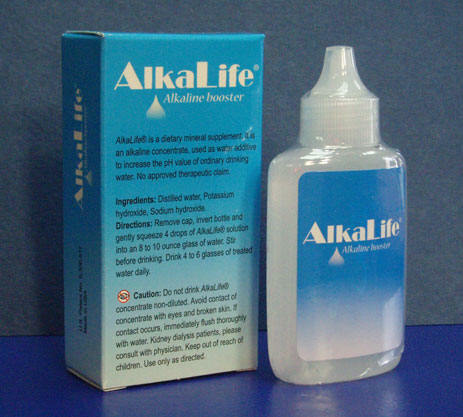 The inexpensive way to get alkaline water is Alkalife Alkaline Drops. We even drink it with Microwater. You are currently on our Ange AW-960 Micro-water Ionizer page. Get the scope on the legendary Pure Porte II Microwater Ionizer. Did you know that the Pure Porte II was replaced by the new and improved Excel-V Microwater Ionizer? You should put Acupeds Detox Foot Pads to the test if you have silver fillings, and other heavy metals deposit. The Acupeds Ingredients are various herbs from all natural sources. 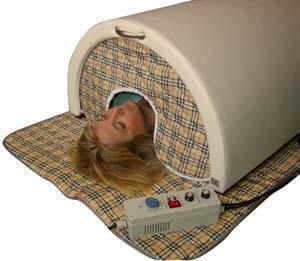 Acupeds will detoxify you of heavy metals.